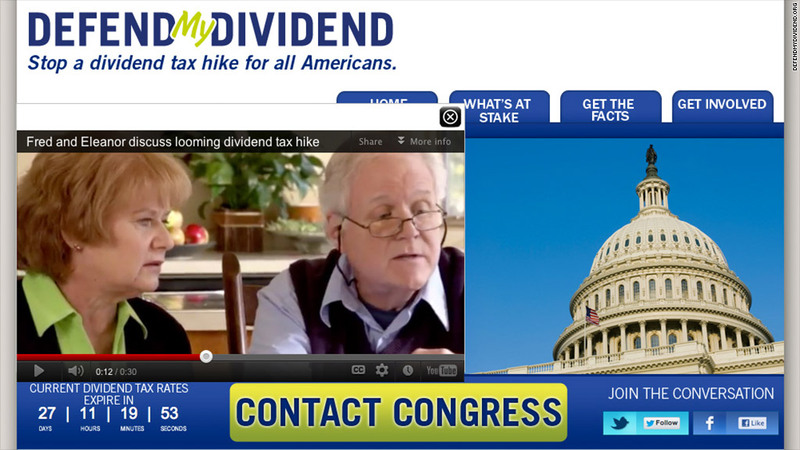 Groups like Defend My Defend are running ads like this one and flying CEOs to Washington next week to push Congress to stop the expiration of tax breaks on dividends. Hundreds of companies -- especially utilities and telecom firms -- are sharpening their lobbying efforts, with seven executives flying to Washington next week to tell lawmakers that dividend hikes will hit seniors hard. "These are not fat-cat investors. These are people with kitchen table economics that drives their need to invest in these types of securities," said Thomas A. Fanning, CEO of Atlanta-based electricity generator Southern Co (SO). The tax rate on stock dividends, quarterly payments from companies to shareholders, is currently capped at 15%. If the nation tumbles over the fiscal cliff, and all the Bush-era tax cuts expire, dividends would be taxed as ordinary income -- more than 40%, including the Medicare surcharge, for the wealthiest. Dividend taxes are especially important to telecom and utility companies that woo investors with big payouts. Southern, for instance, pays its shareholders an annual dividend of $1.96 a share. That's a dividend yield of 4.6%, compared to an average yield of 2.28% paid out by companies in the Standard & Poors 500 index. If dividends are taxed at a higher rate, investors may be less attracted to stock of companies with higher payouts. Southern's Fanning says tax hikes on dividends would hurt economic growth and could cause companies like his to lose as much as 15% of their value, "which means seniors' nest eggs will lose significant amounts of value." The companies have banded together to create progressive-sounding groups such as Defend My Dividend and the Alliance for Savings and Investment, whose rosters read like a who's-who of utilities and telecom companies. They include Verizon (VZ), AT&T (T) and Southern, as well as other blue-chip companies that pay higher dividends like United Parcel Service (UPS) and Altria (MO). The groups have an ad running on national cable TV channels (including CNN) that features two seniors at a kitchen table talking about taxes on dividends. "That's a big part of our retirement," one says, reminiscent of the Harry and Louise ads blasting health care reform in the 1990s. Critics, however, argue that dividends benefit wealthier households. About 46% of dividends awarded in 2010 went to investors in the top 1%, according to a Tax Policy Center analysis. "There probably is an element of truth in that, generally speaking, older people are looking for more stable investments and may tend to be in dividend-yielding stocks," said Joseph Rosenberg, a research associate at the Tax Policy Center. "The anecdote (in the TV ad) is probably more compelling than the data." Under the president's plan to avoid the fiscal cliff, dividend taxes would remain at 15% for the middle class but would be taxed as ordinary income for families making more than $250,000. The dividend groups don't like the president's plan. That's because it does not have the same rule for gains on sales of stocks, bonds and real estate. It calls for raising taxes on those sales from 15% to 20% for the wealthiest Americans. But the cap makes them better investments on a tax basis for the wealthy. "Don't let federal tax policy create an incentive to invest in riskier securities," Southern said about the Obama plan.